The SDA Editorial Board is curating a number of projects to highlight historically significant documents in the Stalin Digital Archive. Many of these documents will be transcribed and/or translated to ensure that these documents are more accessible to users of the platform. To date, 759 transcriptions and 255 translations have been completed and uploaded into the digital archive. Click here to view a list of Editor Projects. Not sure how to check if a document has a transcription or translation? Use the viewing and sorting options in your search results to identify which documents have transcriptions and translations associated with the scanned images from the RGASPI archive. This information is available in the “# of Transc Pgs” and “# of Transl Pgs” Result fields. You can also access transcriptions and translations via the “Content Type” filter on the Browse page. Private Groups allow SDA users to share and collaborate within a private environment. Private group members can share documents, tags, annotations, and discussions with other members of that group. Watch these tutorials to learn how easy it is to setup a private group. 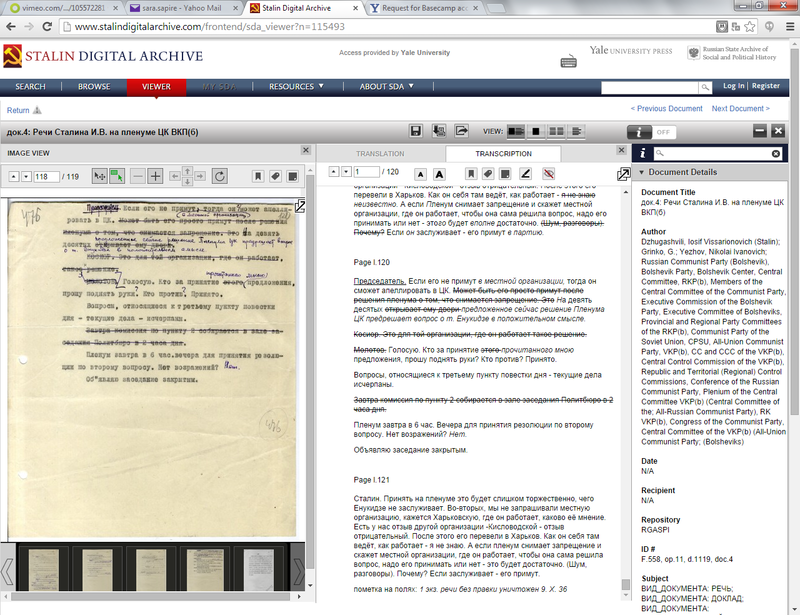 Help us continue to improve the Stalin Digital Archive by joining the SDA User Group! Please contact us at support@stalindigitalarchive.com if you would like to participate in interviews and demonstrations designed to make the SDA a better digital, scholarly resource.